So where do we start analyzing the niche regarding its SEO perspectives? No doubt the first step is keywords analysis. Every niche name in fact is a keyword. Therefore, first of all you need to estimate the amount of searches for this keyword in Google (and for those that sound alike). 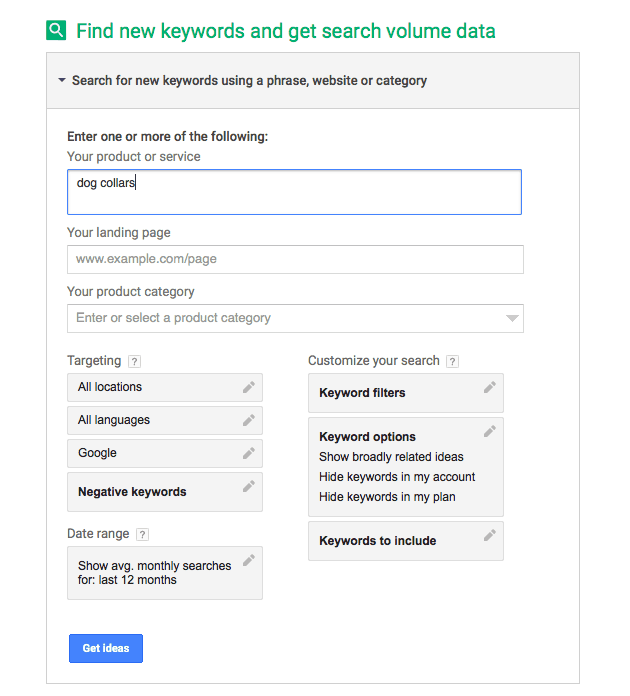 You can do it with Google Keyword planner tool. 4. You will get the list of keywords that are related to this niche with approximate amount of searches in Google for them. By defaults the date range is 12 months, you can set your own range on the left sidebar. 5. So dogs collars has between 10K and 100K searches which is perfect result for the dropshipping niche – it has some demand but it doesn’t exceed the sensible limits. If there are more than 100K searches, the niche is too wide and the competition there will be simply monstrous. If there are less than 5K searches – skip to the next niche option, this one probably has neither competition nor profit.